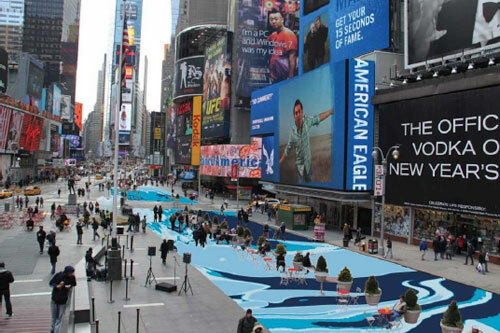 The city began work today on Molly Dilworth’s “Cool Water, Hot City” installation in Times Square. While it was nearly hot enough to fry in egg in Times Square Tuesday, things have since cooled off a bit, and not simply because the temperature dropped back into double digits. Today the city’s Department of Transportation began installing in the public plazas Molly Dilworth’s 18-month installation, “Cool Water, Hot Island,” which will not only prettify the eight newish plazas with an abstracted heat map of the city but also reflect some sunlight, making for a more comfortable experience. Meanwhile, DOT along with the Department of Design and Construction announced that it had selected Nordic knockouts Snøhetta as the lead designer for the long-term transformation of the square. The selection of Snøhetta is not exactly a surprise, as it is one of the eight firms in the city’s Design + Construction Excellence program, from which DOT had already said it would make its choice because it streamlines the design process as the firms are prequalified. Yet it was Snøhetta’s experience outside the city that helped win it the commission. “It is a classic New York story that reconstruction of the ‘Crossroads of the World’ will be led by a firm with an international reputation for creative vision and excellence,” DDC commissioner David Burney said in a statement. Snøhetta’s preference for public art, landscape design, and sustainability may have played a role in its winning the commission. Still, the nature of the project is rather new to the firm, most of its successes having come through buildings such as the Library of Alexandria and Oslo Opera House, though both are incredibly public in their nature, so Snøhetta should prove a good, and certainly interesting fit, as its work at Ground Zero has shown. Joining the Oslo- and New York-based firm on the design team are WXY Architecture and Design, Weidlinger Associates (engineers), Mathews Nielsen (landscape), Billings Jackson Design (industrial), and Bexel (audio-visual), all of whom are Excellence program participants. The design work is just beginning, with no time line or budget yet set for its unveiling, according to a DOT spokesperson, though the plan remains to begin construction in 2012. The firms will be responsible for improving the pedestrian experience in the plazas as well as the infrastructure for the various events held in Times Square throughout the year. “Our goal is to improve the quality and atmosphere of this historic site for pedestrians and bicyclists while also allowing for efficient transportation flow for the betterment of the city,” said Craig Dykers, head of Snohetta’s New York office and its co-founder. And in more Molly Dilworth news, online art gallery Art We Love is selling a series of seven prints for 15 bucks a pop.